Plastic (snap-in) for type BR 1" space. May also be used with 400 amp and 600 amp load centers. For grounding copper or aluminum terminals in a GE load center. 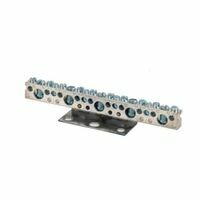 Offers 4 small holes for 14 - 8 AWG copper or 12 - 8 AWG aluminum terminals and 3 large holes for 14 - 4 AWG copper or 12 - 4 AWG aluminum terminals. UL Listed and ANSI Certified. 6.875" height x 2.875" width x 0.5" depth, .105 lb. Covers circuit breaker knock outs that have been removed in error. Two 1" and two 1/2" plates. Used in load centers, CSED devices and NQOD and NF panel boards. Each terminal accepts (1) #14 - #4 copper wire or (1) #12 - #4 aluminum wire, (2) #14 - #12 copper wire or (2) #12 - #10 aluminum wire. NOTE - Consult local code for correct application of ground bar kit for service entrance equipment. ANSI Certified and UL Listed. For use with wire range 6-2/0. Can be mounted on any neutral or ground position by simply removing the termination screw. UL Listed. 2.875" height x .75" width x 6.875" depth, .07 lb. Made for QO load centers. Field installed for number 12 - 2 Al or number 14 - 4 Cu wire. QO accessories can only be used with QO load centers. Used for additional grounding as required by local code. Compatible with most load center enclosures. Fits solid or stranded 4 - 14 copper wire and 10 - 12 aluminum wire. Includes mounting screws. UL Listed and ANSI Certified. 11" height x 3.5" width x 0.5" depth, .304 lb. Fills opening in covers if twistout is removed in error. QOFPCP are used only in QO load centers, filling the spaces where no circuit is attached. CHOMFPCP are for use only in Homeline load centers. UL Listed and ANSI Certified. Used in load centers, CSED devices and NQOD and NF panel boards. Each terminal accepts (1) #14 - #4 copper wire or (1) #12 - #4 aluminum wire, (2) #14 - #12 copper wire or (2) #12 - #10 aluminum wire. NOTE - Consult local code for correct application of ground bar kit for service entrance equipment. ANSI Certified and UL Listed. 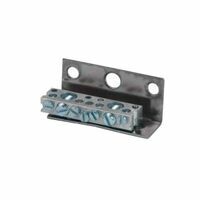 Breaker box neutral lug is designed for Homeline load centers. It works with number 1 - 1/0 copper and aluminum wire. UL Listed, ANSI Certified. Used in load centers, CSED devices and NQOD and NF panel boards. Each terminal accepts (1) #14 - #4 copper wire or (1) #12 - #4 aluminum wire, (2) #14 - #12 copper wire or (2) #12 - #10 aluminum wire. NOTE - Consult local code for correct application of ground bar kit for service entrance equipment. ANSI Certified and UL Listed. Used in load centers, CSED devices and NQOD and NF panel boards. Each terminal accepts (1) #14 - #4 copper wire or (1) #12 - #4 aluminum wire, (2) #14 - #12 copper wire or (2) #12 - #10 aluminum wire. NOTE - Consult local code for correct application of ground bar kit for service entrance equipment. ANSI Certified and UL Listed. For equipment grounding provision. #14 to 4 AWG, 60/75 degree Celsius, Cu/A1. Siemens Ground Bar Kit, Series: ECLX, 7 Terminals, NO 14 - 6 Small Opening, NO 14 -1/0 Large Opening Conductor, ANSI Specified, CSA Certified, UL Listed, For Use With Murray branded Load Centers That are 12 1-Inch Spaces or Larger Bar wire holes are suitable for (1) #14-4 or up to (3) #14-10 aluminum or copper wire. Multiple wires in a single hole must be of the same size and material. Distance between mounting holes is 1-3/4". NOTE: Consult local code for correct application of ground bar kit for service entrance equipment. Kit contains one ground bar and two #10-32 x 5/8" self-threading screws. UL Listed. Siemens Ground Bar Kit, Series: ECLX, 11 Terminals, NO 14 - 6 Small Opening, NO 14 -1/0 Large Opening Conductor, 3-1/2 in Length, 5.1 in Width, 5.1 in Height, ANSI Specified, CSA Certified, UL Listed, For Use With Murray branded Load Centers That are 12 1-Inch Spaces or Larger Fits any meter socket application where a closure plate is needed. Used in load centers, CSED devices and NQOD and NF panel boards. Each terminal accepts (1) #14 - #4 copper wire or (1) #12 - #4 aluminum wire, (2) #14 - #12 copper wire or (2) #12 - #10 aluminum wire. NOTE - Consult local code for correct application of ground bar kit for service entrance equipment. ANSI Certified and UL Listed. Siemens Ground Bar Kit, Series: ECLX, 19 Terminals, NO 14 - 6 Small Opening, NO 14 -1/0 Large Opening Conductor, ANSI Specified, CSA Certified, UL Listed, For Use With Murray branded Load Centers That are 12 1-Inch Spaces or Larger Bar wire holes are suitable for (1) #14-4 or up to (3) #14-10 aluminum or copper wire. Multiple wires in a single hole must be of the same size and material. Distance between mounting holes is 1-3/4". NOTE: Consult local code for correct application of ground bar kit for service entrance equipment. Kit contains one ground bar and two #10-32 x 5/8" self-threading screws. UL Listed. Used in load centers, CSED devices and NQOD and NF panel boards. Each terminal accepts (1) #14 - #4 copper wire or (1) #12 - #4 aluminum wire, (2) #14 - #12 copper wire or (2) #12 - #10 aluminum wire. NOTE - Consult local code for correct application of ground bar kit for service entrance equipment. ANSI Certified and UL Listed. Steel enclosure. 2 pole, 3 wire, 240 volt AC, rated 10 HP. For central air conditioner. Removable closing cap not included. Equipment ground. 14 - 3 AWG lug wire range. 4-3/4" x 7-1/2" x 2". 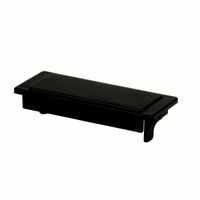 UL1429 enclosure pullout switch, UL Listed. For equipment grounding provision. #14 to 4 AWG, 60/75 degree Celsius, Cu/A1. For equipment grounding provision. #14 to 4 AWG, 60/75 degree Celsius, Cu/A1. Single phase, 2 pole, 2 wire, 240 volt AC, galvanized steel enclosure with molded case switch. Rated 3 HP at 120 volt, 10 HP at 240 volt. For bottom entry and exit only. Heavy duty, high strength enclosure with welded and riveted construction. Swing-up cover remains in place when in open position, and includes provision for padlocking. 10,000 AIR. When pullout is in off position, protective shield can be removed for access to fuses. No.GB4 ground bar and No.96-3258-4 pullout head replacement sold separately. #14-3 AWG wire range. 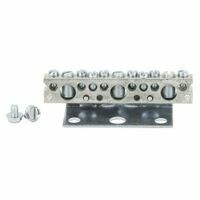 5-3/8" x 8-3/4" x 3-1/8". UL Listed file No.E5239. Bar wire holes are suitable for (1) #14-4 or up to (3) #14-10 aluminum or copper wire. Multiple wires in a single hole must be of the same size and material. Distance between mounting holes is 1-3/4". NOTE: Consult local code for correct application of ground bar kit for service entrance equipment. Kit contains one ground bar and two #10-32 x 5/8" self-threading screws. UL Listed. Single phase, 2 pole, 2 wire, 240 volt, rated 10 HP, steel enclosure. All lugs positioned for bottom entry and exit wiring. Easy mounting for quick installation. Pullout head can be replaced in off position. 10,000 AIR. 12 - 3 AWG al, 14 - 3 kcmil cu lug wire range. 5-5/32" x 7-5/16" x 2-7/32". UL Listed.